Supplied in stainless steel AISI 316 (other materials upon request), thermowells are intended to protect thermometers and temperature sensors of high pressures, corrosive media, etc and also allows removing the instrument when the process is being carried out. Two main thermowell types are available: the weld-in type is the economic type because of it contains weldings in the body, and the bar stock thermowell, specially indicated for high pressures and temperatures. the stem may be filled with suitable thermic oil. 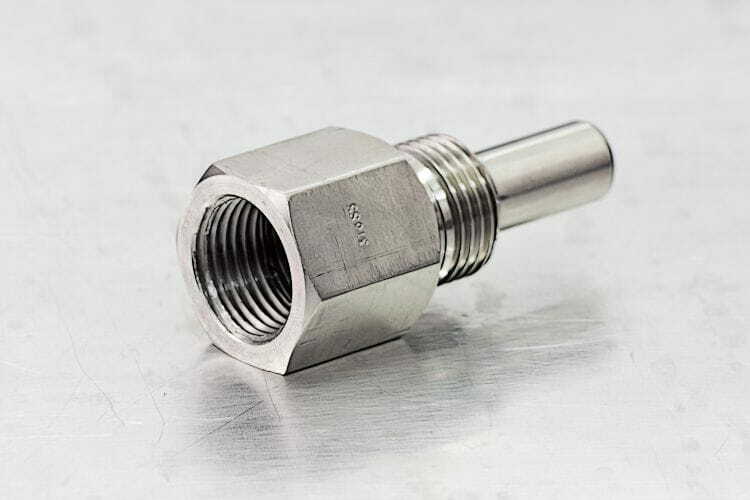 When ordering, the following information should be observed: Instrument stem length and diameter (indicating if thread is included), connection thread, process hole diameter, material required and any special influencing variable (high pressure, etc).